Hans Haveron is an internationally known visual artist and muralist spending most of his time in between NYC, LA and Miami. 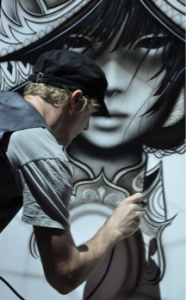 For the last 12 years he has been showing worldwide along the sides of many heavy hitters such as Shepard Fairey, David Lynch, Alex Grey, Audrey Kawasaki, El Mac, Retna, Kofie, Mear One, John Park, Android Jones, YOKII and many more. Alongside of these “ART” projects, Haveron is also a 892 Union Costume Designer in the Hollywood film machine. Gaining popularity quick in biz for his signature style body costuming with airbrush which is now a hugely popular trend on the west coast. He has been able to work on many films, music videos, commercials and Fashion Week events with top ranking clients from Disney, Brittany Spears, Tim Burton to British GQ.